Following the closure of the “Paddy Line” in 1965 the Mossdale to Gatehouse Station footpath, cycle and riding route has become very popular with both local residents and visitors alike. Unfortunately, in recent years , weather and poor drainage has taken its toll and it’s now time for some renovation and improvement works. Work will start on Monday 3rd December 2018 and will include clearing drainage ditches and culverts, some path re-surfacing, new gates, vegetation clearance and the replacement of the bridge over the burn near the old Loch Skerrow rail halt. The work will improve access for all users but will involve some temporary inconvenience as the works progress. The work will take approximately two months depending on suitable weather but will deliver a much-improved path. 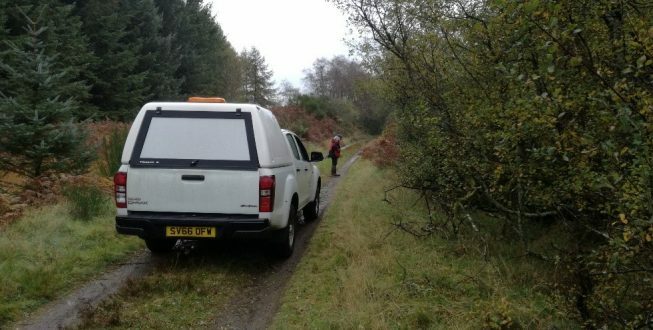 The works will be undertaken by contractors to Dumfries and Galloway Council, Environment Service with the assistance of the Galloway Glens Landscape Partnership. Please be aware that contractors will be carrying out work at various locations on the footpath up to February 2019. Please approach working contractors with caution and ensure machine operators know you are there before passing. Please follow instructions given by the contractors for your own safety. If you have any questions regarding the work please contact Jonathan Barrett, Galloway Glens Land Management and Access Officer on 07469 571806.